As the new secretary of the Department of the Interior, Sally Jewell is now the chief steward of our nation’s imperiled wildlife and most of our public lands. She is responsible for the protection of some of the rarest species on Earth, as well as approximately 20 percent of the nation’s lands, including our treasured national parks and wildlife refuges. It’s a big job and a lot is riding on her decisions. Sadly, conserving our nation’s endangered wildlife has not, to date, been a focus of the Obama administration. That can change with Secretary Jewell. It is my hope that she will re-energize the Department of the Interior, reconnect with its conservation mission and recommit the federal government to imperiled wildlife protection before more endangered species sink closer to extinction. This country has the conservation tools, thanks to the Endangered Species Act, and the know-how for recovering imperiled species. We just need the administration to be a more effective advocate for wildlife. With the appropriate resources and commitment, the Department of the Interior can accelerate the recovery of hundreds of endangered and threatened species that are in urgent need of more focused conservation efforts. Sound science was supposed to have been the hallmark of the Obama administration’s conservation decision-making, but too often it has seemed that other factors have been given greater weight. The U.S. Fish and Wildlife Service’s recent proposal to delist the gray wolf across most of the Lower 48 is a case in point. This flawed delisting proposal was in the works well before Secretary Jewell took her oath of office. She still has the opportunity to course correct on wolves and ensure that all policy decisions going forward are guided by sound science and long-standing policy, and not driven by what is expedient. One bright spot is the department’s efforts to advance renewable energy on federal lands. If we capture energy from solar, wind and geothermal sources, we can effectively wean our country off the outdated, dirty energy sources of oil, gas and coal. Defenders has worked with the department to make sure we do this in a smart way that doesn’t destroy important wildlife habitat. Secretary Jewell should keep wildlife conservation a priority as we continue down this path. There is so much work to be done to protect and restore the wildlife, lands and natural resources that are under the responsibility of the secretary of the interior. Jewell has the chance to be a true steward as our nation’s top advocate for imperiled species and important public lands. 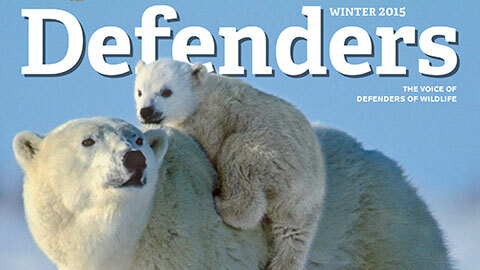 At Defenders, we wish her true success as she takes on the significant environmental challenges that lie before her, and we stand ready to work with her as we, as a nation, face these challenges together. Some of Pam Hartman’s earliest childhood recollections involve running around with a Kodak Brownie camera in her hand. Her lifelong passion for photography paid off when this photo of a mother polar bear and cubs garnered more than 12,000 online votes in Defenders’ annual photo contest.